Hey guys and gals no more being sexiest in myreviews from now they are PG and politically correct to Australian standards ofPauline Hanson! Ha! If you not Aussie think of her as the Donald trump of Australia! Sosit back and grab a drink and some popcorn maybe some Panadol and enjoy. I feellike I should just cut and paste my reviews like other people. 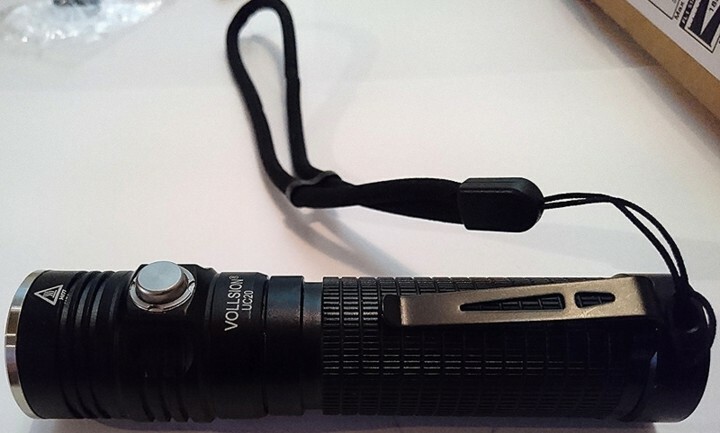 Okay today we will be reviewing the VollsionUC20 flashlight this is a single 18650 side switch utility flashlight. Say thatfast 3 times! Vollsion messaged me on here and ask me to do a review for them.So I am guessing a few of us have this light? Also there standard for reviewersis probably not high after asking me ha! I have had this light for a week and half andhave been EDCing the UC20. 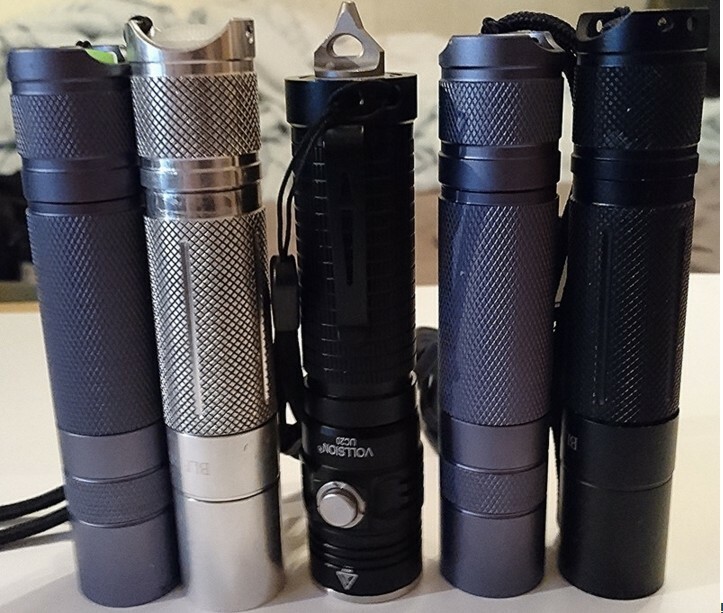 Normally I wouldn’t EDC an 18650 flashlight but Ihave found my self carrying around my modded S2+ so this being smaller it makessense to EDC the light for a bit. 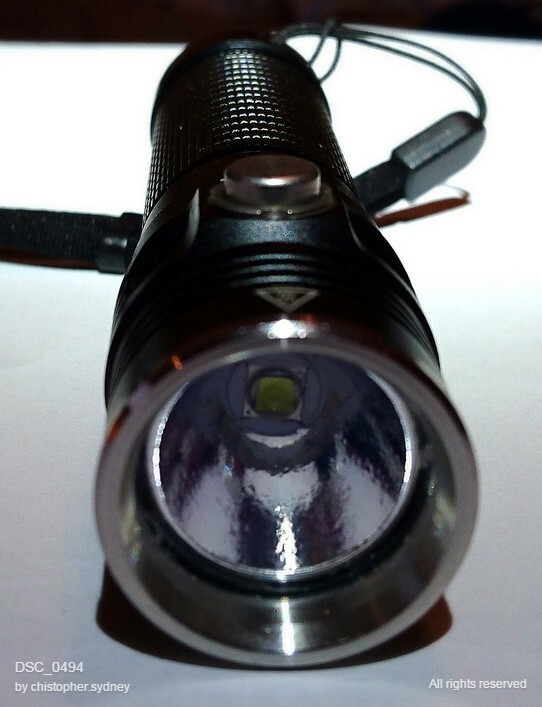 Think of this light as a more finished S2/A6with an electronic side switch. So what makes this light more finished? Fromthe factory you get extra options like AR coated glass a bigger deeper OPreflector you also get a stainless steel bezel and a stainless steel clip andthe ability to run CR123/16340s and the fact that it is IPX8 and 2 meter impactresistant. These are extra features that you can account for the extra cost ofthis light. I do not Know the retail price I should probably ask and add ithere. I have done similar mods to my S2+. Okay so what do we all love? Lumens! Unlessyour name is brick then you love lamp! 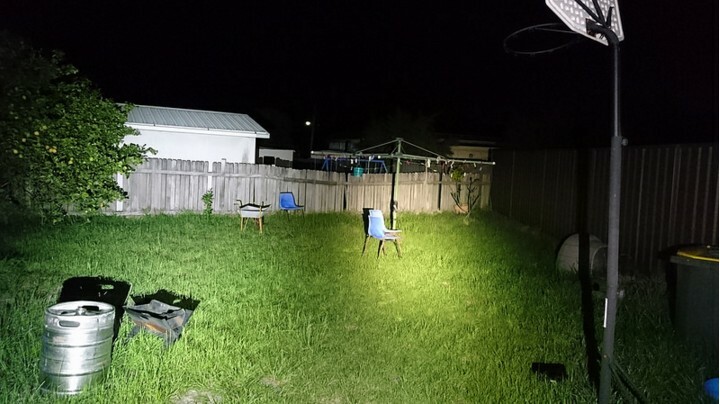 So this light puts out a max of 850lumens rated by ANSI FL1 standards. Which isn’t spectacular for a light of thissize. But I have a sneaking suspicion it is actually higher then that. It lookslike it pushing the 1000 lumen mark. Now as I said in my last review we havebeen stuck with productions lights at around 1000 lumen for a while now.Thinking about this more their is not much a manufacturer can actually do untilCree ups stock output of there emitters. So seeing 1000 lumen is becominggeneric! 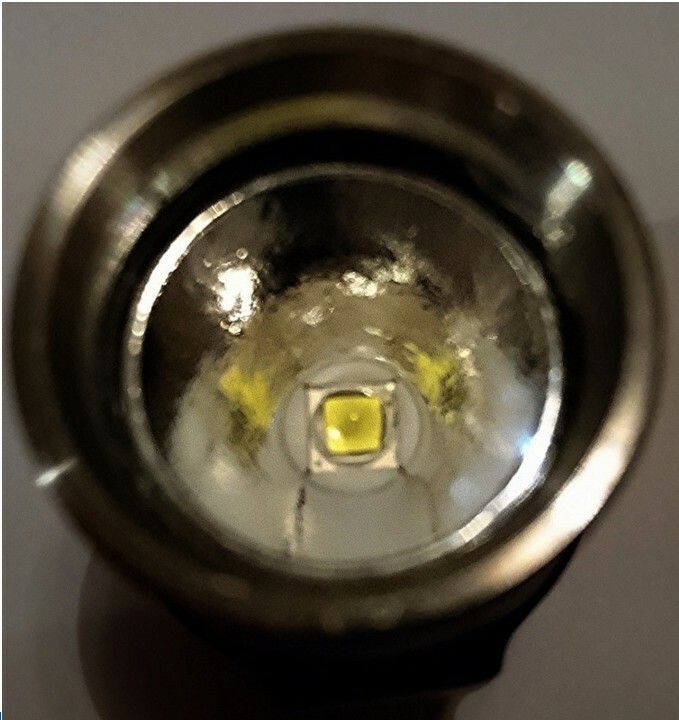 Seeing as this light uses a Cree XML2 it falls fate to this fact of a1000 lumen max output. Unless your a regular member of BLF then 1000 lumen isthe just the beginning hahaha! SB could probably rename the website FLFflashlight loony Forum! I fall under this category for sure! I would directdrive every thing if I could! The UC20 has 3 modes as standard and onehidden strobe mode for you disco lovers. 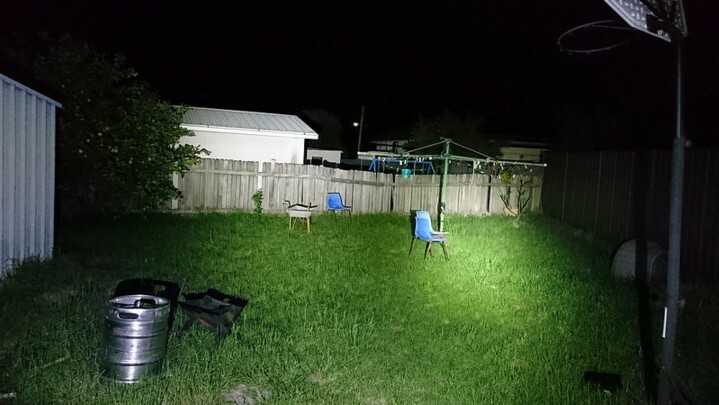 High: 850 lumen @ 1.5 Hours run time. 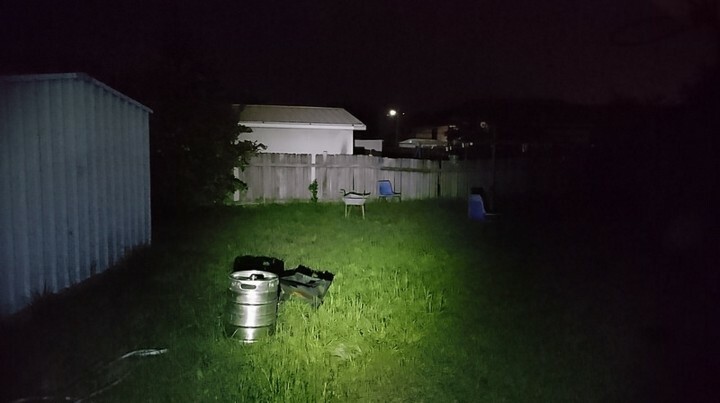 Medium: 400 lumen @ 3.5 hours run time. Low: 30 lumen @ 35 hours run time. 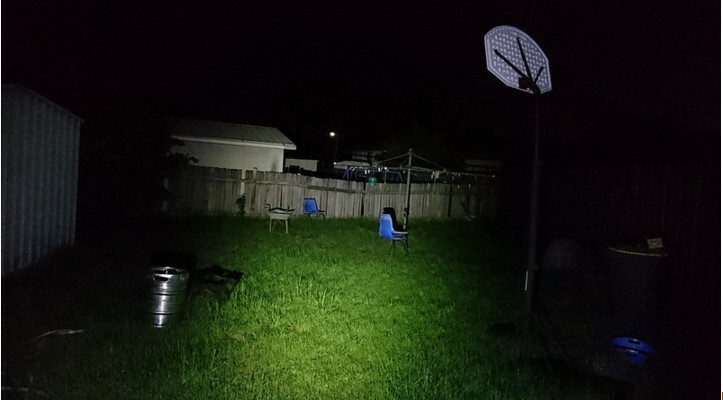 Strobe: 850 lumen @ unknown run time. Now lets talk about the electronic switch. Itis raised over the body of the UC20 for easy access and does not have a lockout so unless you want to use the clip to carry the UC20. I think you may havean issue with the light turning its self on. I am rolling the light around onmy mouse pad and it turns on fairly easy. Which is good because the switch issuper responsive. In hindsight i have had the UC20 in my pocket rubbing against stuff and I havemanaged to turn the light on. Which is to be expected! Yes that is a flashlightin my pocket I am not that happy to see you! Now for me not much of an issue because I do not usually EDC an 18650flashlight. But my EDC does sit inside my bag which does have a habit ofturning lights on because I keep other EDC items in the bag so could be afuture problem if i used this light as an EDC. So you would have to be carefulof where you store the UC20. The switch its self is a stainless steel switch itlooks like it is painted. So it looks like plastic I would have kept it bare.The glass breaker is also the same color and it is also stainless steel. Butthe front bezel is SS and is kept bare and is not painted. The flashlight alsohas a memory mode so simply click once to turn it on or of and it remembers thelast mode you had it on. As per usual hold the switch to change modes andstrobe is simple when the light is already on simply push switch twice fast toaccess strobe. 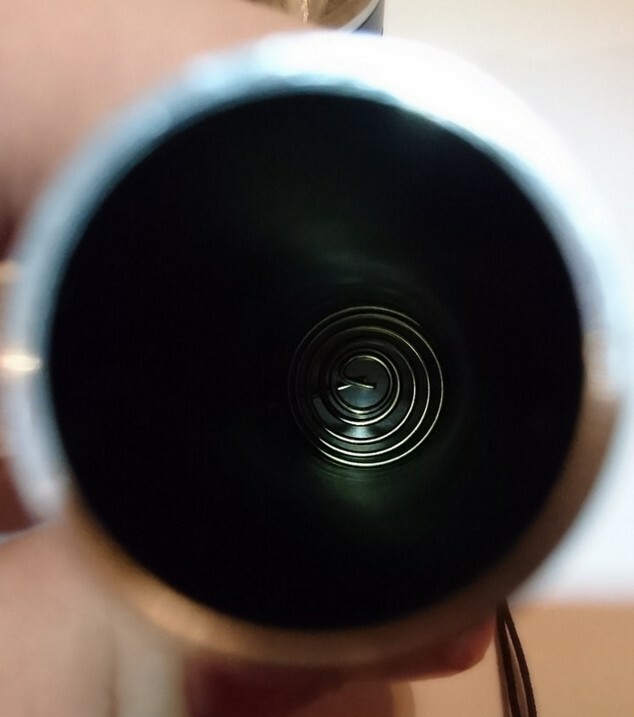 The flashlight comes with a hole on thebottom where you can attach the glass breaker it simply screws in the hole. Yesmy kind is currently wondering about adding a dirty joke. The hole also doublesup as a Tripod mount. The UC20 can be used on a tripod which makes it a perfectcompanion for a work light! You can also but your wiener in the hole if yourinto that stuff. Being an electronic side switch they could ofadded and a magnet around the hole at the bottom of the light. That would havebeen perfect as it has the space for it. Maybe if Vollsion make a secondversion they can take that into account what I am saying. A few simple thingswould make this light unstoppable. If you use the glass breaker on the lightthe UC20 can not be tail stood but it is easy enough to take of. If you happento need to tail stand stand the light. Or just stab it into the surface andmake sure it sticks! 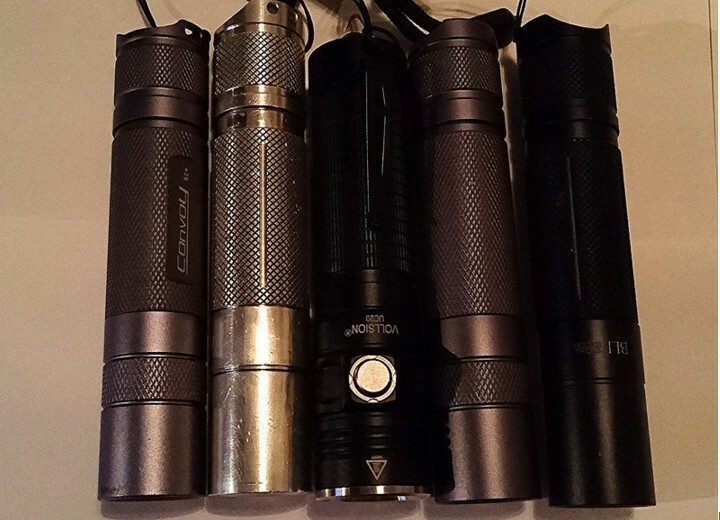 The UC20 size wise is small not the smallestsingle 18650 flashlight but no where the biggest coming in at 275px which is smaller then Convoy S2+ whichis 292.5px long.The head is 67.5px widecompared to the S2+ which is 60pxwide. 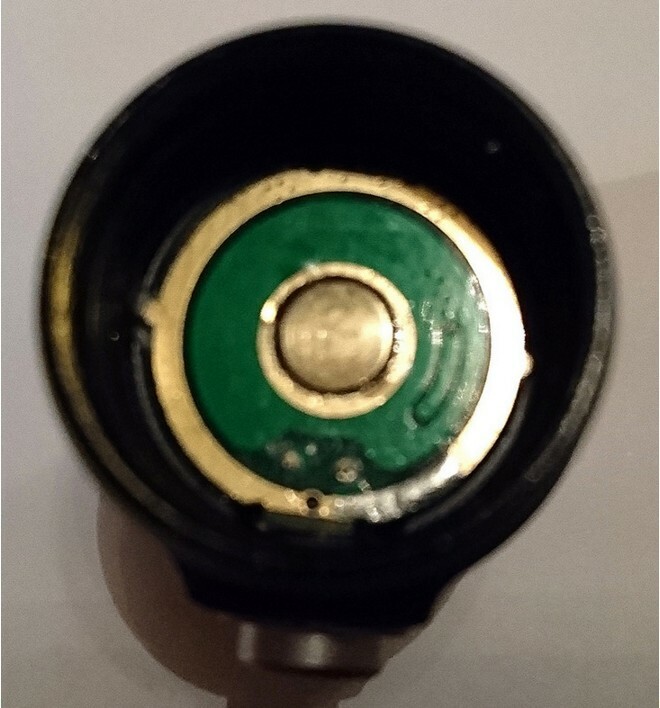 The UC20 is not fully round it has a built in anti roll feature which ison the other side of the button. This is a super handy feature this point isthe widest point of the UC20 coming in at 77.5px if you include the button. The UC20 weights 79grams with out the battery and weights 125 grams fully loaded so its a tadheavier then the S2+ not noticeable. The beam pattern on the UC20 is awesome usingthe Cree XMl2 helps with the spread out beam. Vollsion is also using a mildorange peel reflector and double coated anti reflective glass the beam patternis really impressive. The UC20 has a peak beam intensity of 8600cd so a maxbeam distance of 185 meters which could be achievable the reflector on thislight is deeper and wider then the stock S2+/A6 reflectors the AR glass alsohelps. It is made out of the usual Aerospace aluminum alloy and I was surprised tofind type 3 hard anodizing this is a place where a lot of companies skimp out!Vollsion did not. Looking at the UC20 it is not made to be takenapart. Most parts are glued even the bezel is. So I can not look at theinternals. Vollsion say they are using a constant current driver with multiplevoltages because the UC20 can be run on two CR123/16340s also. This is a coolfeature in some countries this means you can pop into a shop and buy CR123 in a pinch if you need them. 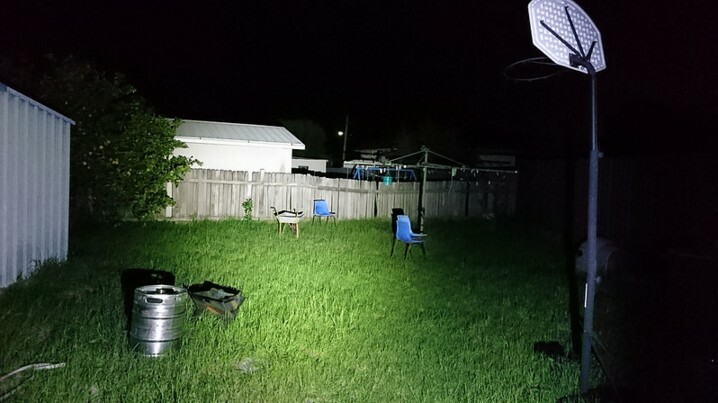 Using an18650 I am getting around 3 amps of current so it is around 1000 lumen easily. The build quality of the UC20 is good nosharp edges or missing anodizing and no scratches. The threads are thin butthey are really well cut and having so many threads 5 in total on the head it takes a while to open and close so Isee no problem arising. The threads came lubed always a bonus! 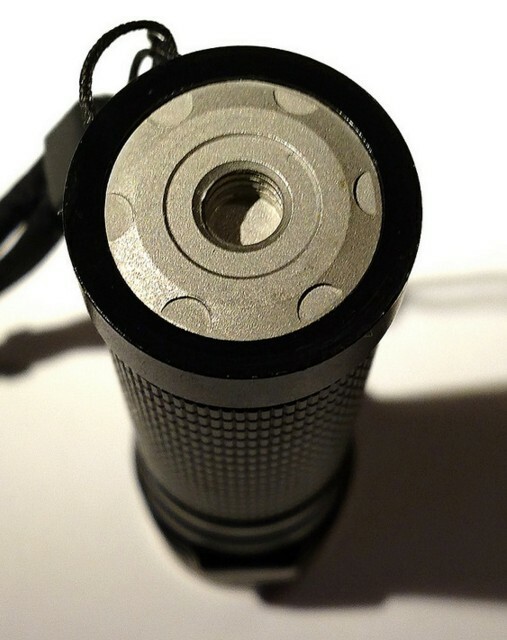 The knurling isdone good and looks different to most light. I will add there is no spring onthe head so you need to use raised cells. Flat tops work but they may rattle atad if shaken. This light is made for button top cells. Makes sense since itisn’t using that many amps. 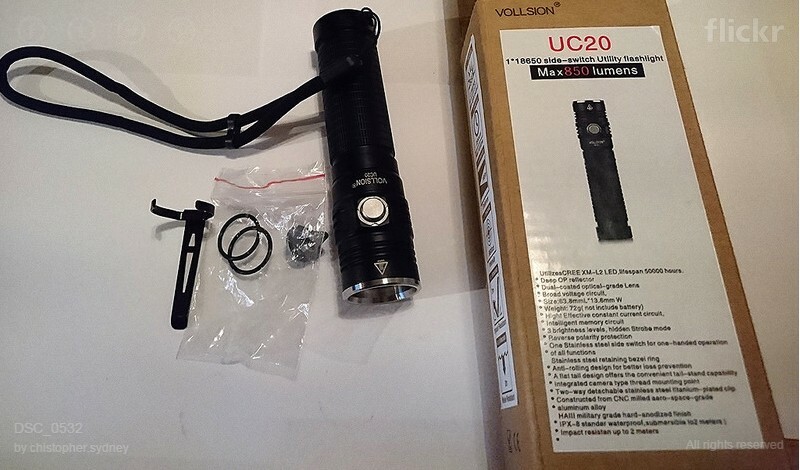 Overall the UC20 is a well thought out lightwith a few minor improvements they will have a perfect light on there hands. Bythe way it is built you can tell that Vollsion put a lot of effort and thoughtinto this light the UC20. It gives you the versatility of the S2/A6 size andshape also the same output as these lights. But with added features that makeit more EDC friendlily like an IPX8 rating and a solid drop resistance and theability to use store bought batteries. 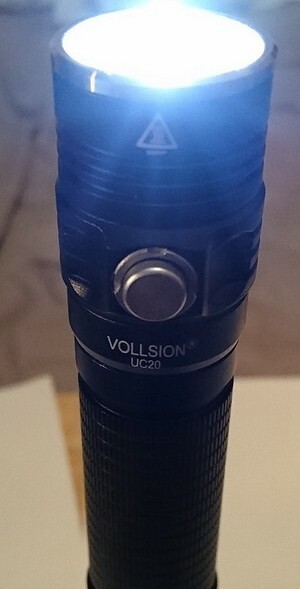 Vollsion UC20 high mode. I need to cut mylawn! High mode i tried to get a wide angle to showyou how floody the beam is. As you can see i am no photographer lol! Low mode be looking like a cartoon because ofauto adjust. Vollsion UC20 left and S2+ Right you can seethe tint difference. The Tint is on the cool side. The grass looksso green if only it was that good. Video review is here! If you hate readingClick here. My new phone makes it look like i wear makeup. As much as i want to look pretty and all. I want it to stop.